Oxide materials offer an appealing range of physical properties for electronic devices, among them ferroelectricity, ferromagnetism and superconductivity. Combining the first two is for example at the base of a 4-states tunnel junction device , while the last two can be combined to build ultrasensitive magnetic sensors . The understanding and control of the functional properties of oxide thin films and their heterostructures form an ever rising corpus of research subjects over the last 15 years, with impressive breakthroughs on two-dimensional electron gases , integration on Silicon platform  and manipulation of charge and spin currents in spintronic devices . One such device is the so-called magnetic junction, comprised of two ferromagnetic layers separated by a non-magnetic one, either conductive to build a giant magnetoresistance (GMR) element, or insulating to form a tunnel barrier in a tunnel magnetoresistance (TMR) structure. TMR- and GMR-based devices are prominently encountered for memory and sensor applications, due to their switchable resistance states and high sensitivity to an external magnetic field, respectively. The performance of a magnetic junction is tied to the spin-dependent transport across the whole heterostructure. While the CoFe electrode / MgO barrier combination is used in a state-of-the-art, room temperature TMR junction, all-oxide heterostructures are still considered for low temperature operation to take advantage of functional oxides’ unique properties. In particular, magnetic tunnel junctions based on the mixed-valence manganite La2/3Sr1/3MnO3 (LSMO) have shown record TMR ratios, attributed to the half-metallic character of LSMO [6,7]. The highest TMR values were reported for LSMO/ SrTiO3 (STO) /LSMO junctions. However, these results were only obtained on very few junctions [6,7], questioning the reproducibility of large TMR ratios, the type of transport and the link between properties and defects, interface and barrier quality. More generally, several core questions are still open regarding the inadequate performance of manganite-based junctions, and the overall relevance of these functional oxide-based spintronic devices must be further ascertained. In this respect, the consortium was already able to achieve a breakthrough in terms of noise reduction by resorting to materials engineering with a Nb-doped (donor doped) STO barrier in a TMR junction . Whether LSMO is a true half-metal, with 100% spin-polarized density of states at the Fermi level, or a transport half-metal, with close to 100% spin-polarized current , is also a key factor as it might put a hard cap on the maximum achievable magnetoresistance variation in a TMR device. This point can be addressed by resorting to a GMR structure, in which spin-polarized transport is probed (Figure 1). As a matter of fact, such an all-oxide spin valve would combine the high MR ratio usually encountered in TMR devices, with the low noise operation which is a staple of GMR elements . 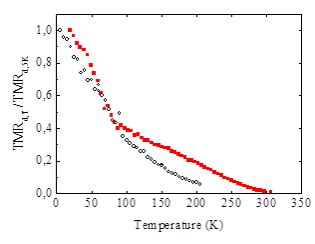 Figure 1: Normalized dynamical TMR versus temperature of LSMO junctions with either a STO (black circles) or a Nb:STO (red squares) barrier. In Nb:STO junctions, the temperature at which the TMR is extinguished has been improved by 100K, now approaching room temperature. This hints at an improvement of the magnetic properties at the LSMO interface. 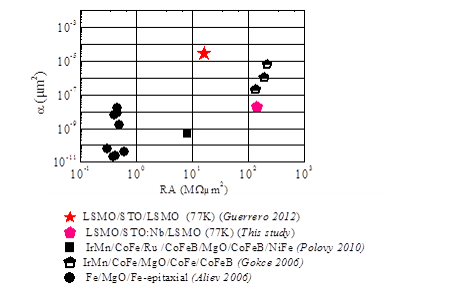 Figure 2: Comparison of the noise level in state of the art metallic and oxide junctions: alpha parameter versus resistance area (RA) product [4-6 and ref therein]. The noise in LSMO based junctions with Nb:STO barriers is now attains the same level as in metallic state-of-the-art junctions.